A meeting between ministers and bank bosses over bonuses has been postponed because the chancellor has been delayed returning to the UK from New York. Several other participants were also unable to get to London because of the snow. No new date has yet been set. 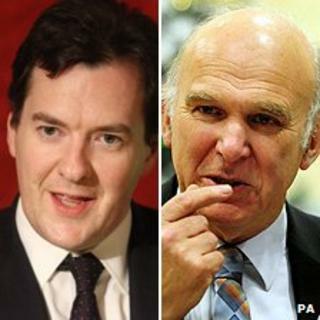 George Osborne and Business Secretary Vince Cable hope executives would agree to pay themselves less and lend more. Deputy Prime Minister Nick Clegg has said the government will "not stand idly by" if bonuses are too high. But Labour dismissed his words as "hot air" aimed at repairing his reputation after the recent student fee protests. The coalition is anxious to avoid a round of lavish Christmas bonuses at Britain's banks, many of which are part-owned by taxpayers, at a time when the rest of the UK is having to tighten its belt. But it is not clear what action, if any, ministers will take. On Sunday Mr Cable told the Andrew Marr Show both coalition parties were "fully signed up" to "robust action". He said: "I think it's fair to say that the bankers do understand the seriousness of the problem." But Mr Cable added: "We can't go through the winter series of bonuses without real restraint and social responsibility." Pressed on what action the government could take, he said: "If they don't behave, if they don't take account of their wider responsibilities the government has, as a possibility, some form of taxation, various ways of doing this. "But we would rather they accepted that they had wider obligations to British business and to the public." The prime minister and the chancellor have emphasised the importance of banking to the British economy amid threats that some institutions could move their operations overseas. Asked if both were 100% behind him on this issue, Mr Cable said: "Yes they are". "There is a recognition that we have to deal with this. There is a coalition agreement. It is absolutely clear and explicit that we have to take robust action... and both parties in the coalition are fully signed up to that." But shadow chancellor Alan Johnson questioned whether the coalition was "serious" about taking action. Asked about Mr Clegg's comments, he told Sky News: "It was a cold day and we needed a bit of hot air. The question is what are they going to do about it?" He said Labour had passed legislation, backed by the Tories and Lib Dems, forcing banks to disclose bonuses of more than £1m but the coalition had so far refused to implement it. "It makes you wonder how serious they are about it," he told Sky. He said Labour would not intervene directly to curb bank bonuses - as that was not feasible - but they would increase transparency and "would certainly put tax up" and use the money raised for spending on infrastructure. He said Labour's temporary tax on bonuses had raised £3.5bn, adding: "There is more money to be taken out of banks - not as retribution - but as a fair share of getting the fiscal deficit down". The British Bankers Association (BBA) said the industry "truly understands people's concern over pay" but the bonus system was "radically different" this year, with recipients seeing the majority of their payments being "locked away for several years". BBA spokeswoman Angela Knight said the UK's financial services industry had to compete for business and "talent" with countries where standards may be more relaxed. "The banks are major employers and pay more tax than any other individual sector, where financial services as a whole contributes £1 in every £10 raised for the Exchequer," she added.